You can enter numbers as hexadecimal, octal or binary. Hexadecimal numbers start with 0x, octal numbers with 0o and binary numbers with 0b. For example: 0b110100 - 0xA. Want to tweak the source code? Visit the project page at GitHub. Q: Can Calculate automatically convert commas to periods for people using international keyboards? Use system font on Mac OS X 10.11 El Capitan. Improvements to display of floating-point precision. Updates for Mac OS X 10.10 Yosemite. Fixed display of floating-point precision. For example, "0.1+0.2" is now displayed as "0.3" instead of "0.30000000000000004". The previous answer is now "ans" (instead of "answer"). Requires Safari 5 or newer and Mac OS X Lion or newer. Added power operator ^. Example: 2^8. If you're a programmer, for xor use >< instead of ^. Command-C copies the last answer. Make sure nothing is currently selected, and press Command-C to copy last numeric answer to the clipboard. Widget dimensions now persistent between sessions. Numpad: The clear key clears the input area. Numpad (International keyboards): the comma on the numpad is inserted as a period. (Leopard only) Fix for autocompletion when Safari 3.1 is installed. (Leopard only) Added autocompletion of variables and functions names using the Tab key. Type the first few letters of a variable name or function name, then press Tab. For example, 1/an<TAB> autocompletes to 1/answer. 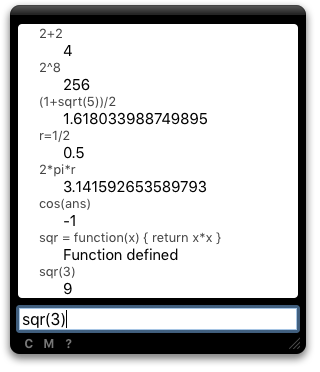 Added several new functions (log2, log10, and many trig & hyperbolic functions). Fixed minor layout issues in Leopard. Widget now has a “back” with a “check for new version” link. (Leopard only) Support for some Unicode variable names, like π (option-p).